Tonight on NBC’s Emmy Award-winning musical competition The Voice airs with an all new Tuesday, October 18, 2016, season 11 episode 10 and we have The Voice recap right below. On tonight’s The Voice episode, the forth and final Battle night puts the singers to the test. 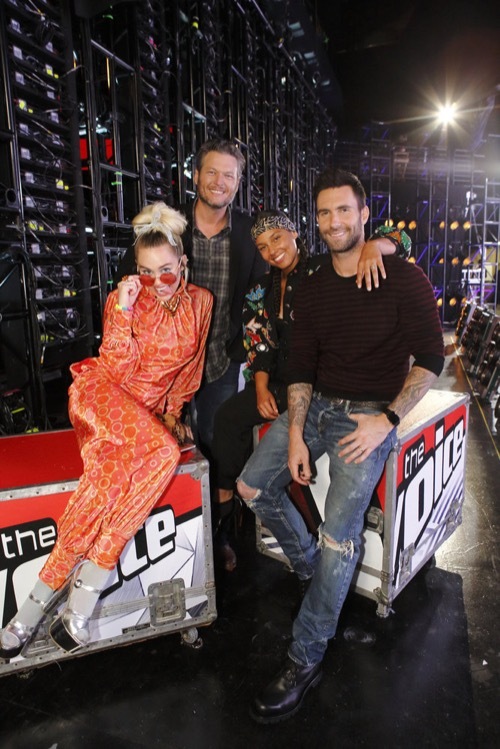 Did you watch last night’s episode where The “battle rounds” continued and Miley Cyrus teamed up with Joan Jett, Alicia Keys with Charlie Puth, Adam Levine with Sammy Hagar and Blake Shelton with Bette Midler? If you missed the episode and what to find out what happened we have a full and detailed The Voice recap, right here for you! #VoiceBattles continue tonight and there’s lots to see with three battles taking place in this round plus we’ll get a look at the Knockouts action. #TeamBlake has its first battle with Preston and Austin who both have legacy family ties to country music. Austin sang with Blake before and Preston’s godmother is Naomi Judd. Bette Midler and Blake greet them and let them know they’re doing CCR’s Bad Moon Rising – it’s a great rock classic. They get notes and then do battle. Alicia says both were strong but Preston was in his swag. Miley says she’s happy in rainbow cloud land where everyone wins so this is hard. She says Austin is already on tour and she says Preston because he could learn a lot from Blake but says no one wins. Adam says she said everything and nothing and laughs. Adam says Austin was great off the back and Preston is so young and great, too so Blake can’t go wrong. Blake says they did incredible and says Preston is on the fast track. He says both nailed it and then decides to take Austin to Knockouts. This #TeamAlicia battle features Broadway guy Gabriel and the only duet this season, sister Whitney & Shannon. Alicia and Charlie Puth meet with the three to work on More Than Words by Xtreme. They get notes and Alicia says she can already tell this will be a tricky decision. It’s battle time! Miley says wow, and says she’s speechless. She says the harmonies made it interesting and says Gabriel made good use of the stage but leans towards the sisters for the win. Adam says the sisters hurt him by not choosing him in the Blinds and are still strong so he gives it to them but Gabriel was fantastic. Blake says Gabriel isn’t getting the credit he deserves in this and the crowd cheers. He says he sang all over the song and has an interesting voice. Alicia says she’s proud of Gabriel for not holding back but after some hemming and hawing, gives the battle to Whitney & Shannon who head to Knockouts. Miley and Alicia talk about putting a tour together for people on their team. They start making plans. These two are #TeamAdam and Bindi relied on music when her mom fought cancer and Brendan is a Brooklyn bartender. Adam and mentor Sammy Hagar have them doing Marc Broussard’s Home. They get some intense notes on their performance and then take the stage for the last battle of the night. They rock the house down hard. Blake says they both sounded good and learned more about Brendan. He says he can’t decide between them. Alicia says Brendan has an amazing tone and Bindi has amazing power but she wanted more fire from her. Miley says she thinks Bindi could have gone higher or harder. She says it seemed too easy for Bindi. Adam says Bindi has a unique voice and he likes her singing in the middle. He says Brendan almost knocked the building down with his voice. Adam goes with Brendan to take to the Knockouts. Blake slaps his steal button and says he wants to hear her some more. That’s a steal to move Bindi to #TeamBlake for the Knockouts. The Knockout rounds start next week and we see a quick glimpse of what’s coming for them and Tim McGraw and Faith Hill serve as advisors.